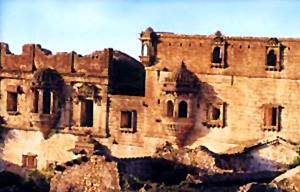 Roha fort is situated on the hillock of the same name, 50 km from Bhuj. It’s height is 500 feet from the ground level and 800 feet from the sea level. Roha was the leading Jagir of Kutch state and there were 52 villages under this Jagir. Rao Khengarji I (1510-1585) established Kutch and became a ruler of Kutch. His brother Sahebji set up Roha village and died after a battle with Raysinhji Zala of Halvad. After his death his successor Jiyaji built two big tanks on the Roha Hill. His son built a fort on Roha hill.